The PELCORTM (Pickens Easley Liberty Corridor) is a planned network of bicycle friendly trails, greenways, parks, and riding destinations located in the Upstate of South Carolina. This endeavor is located in Pickens County and encompasses a 17 square mile triangular area including the cities of Pickens, Easley, and Liberty. Within the PELCOR, bicycle riders of all types (road, mountain bike, and BMX) and skill levels (beginner, advanced, and expert) will find various destinations that accommodate their bicycling ambitions. As the communities recreate they will improve wellness, enhance family, and further their knowledge and appreciation of their local communities. creation of outstanding recreational riding facilities that accommodate all skill levels, and (2) protection and enhancement of the natural environment within which we build and use trails and parks. This community partnership will help the area to establish itself as a regional leader in outdoor recreation and attract increased public use and marketability. Economic success for Pickens County will follow with increased trail-based tourism. Additionally, these communities will continue to work together to promote and advance their individual and collective recreational goals through adoption and implementation of these principles within the larger framework of the Pickens County Vision 2025 plan for community enhancement. We envision our preliminary goal as developing three different ride centers, one in each of the three member cities. The trail systems within each ride center will have custom built skill areas that we refer to as Ride Gardens. Each Ride Garden will have unique and challenging features of varying levels that will provide fun and build riders skills and confidence. The Ride Garden team is inspired to create internationally respected riding destinations and facilities and will embody the principles of sustainability, natural resource preservation, and enhancement during design and construction. Future work will expand the multi-modal network through the use of existing and newly created bike paths, trails, and onroad/offroad routes to provide physical connections between the three main riding centers within the PELCOR. Specific corridors and locations will be determined at a later date in conjunction with other ongoing recreational projects and studies to maximize economic impact and project success. Planning and design initiatives for the three ride centers may be funded through the use of various grants and other economic stimulus packages (hospitality and local sales taxes, state and federal grants, business participation, and financial sponsorships and contributions). Construction costs for individual PELCOR projects require detailed analysis prior to their planning, design, and implementation. PELCOR member communities, Pickens County, and the greater PELCOR region all benefit from significantly increased tourism and economic growth. Identification of strategic recreational goals within the Pickens County Vision 2025 plan identifies additional strategies for economic growth and prosperity. that would memorialize the history and heritage of the site. Within the larger trail master plan were several unique riding features that would set TCP apart from other nearby riding destinations. These include the Ride Garden FlowCoasterTM, wooden berm turn, trident, and rideable bio-swale. Concepts for these features were developed and drafted in AutoCAD to serve as basis for preliminary project budgeting, initial risk assessment and insurance policy discussions, and preliminary construction specifications. 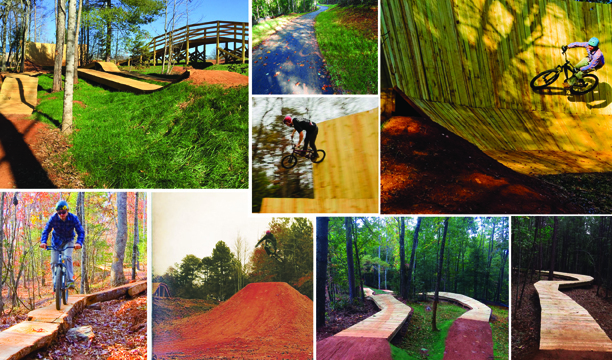 In addition to mountain biking, the five phase master plan with an estimated budget of over $2 million dollars included many other elements including a 3,600’ multi-use paved greenway, 3 miles of singletrack, an 18 hole Frisbee disc golf course, future renovation of a historic grist mill, a park lodge, and other park elements. With the support of the City of Pickens Ride Garden was successful in writing two federal and state grants, a $400,000 Appalachian Regional Commission (ARC) and $100,000 South Carolina Parks Recreation and Tourism Recreational Trails Program (RTP) grant. These grants were awarded to the city of Pickens and raised $500,000.00 towards the total $798,863.00 cost for Town Creek Park, Phase 2 & 3 Improvements construction. 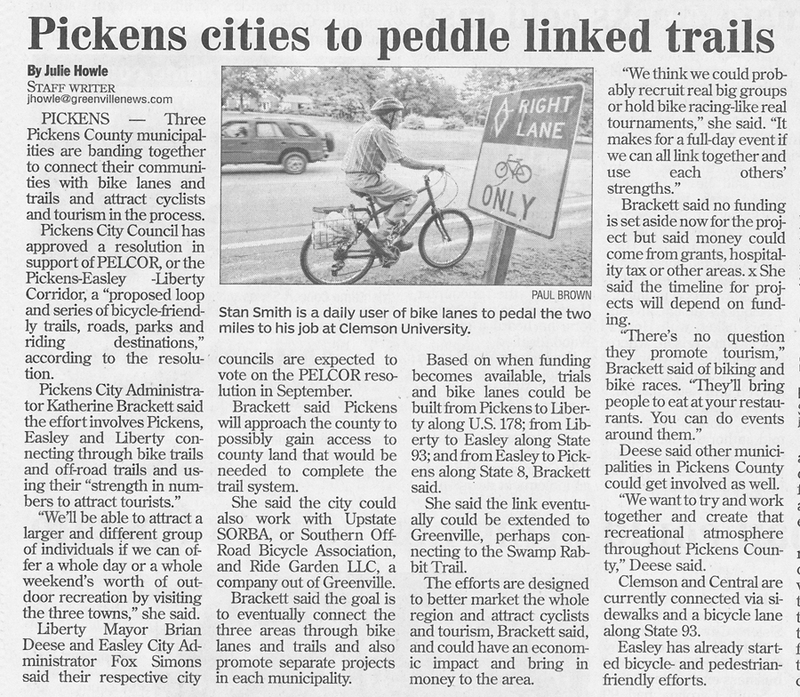 The remaining funding was from match contributions provided by the City of Pickens to build the first bike park destination within the PELCOR. Ride Garden was engaged by the City of Pickens and Darrohn Engineering to provide several services for bike park development. Feature design and consulting, general contractor / PTBA contractor / City liaison, materials sourcing, limited construction, web page development, park signage and branding. implementation of the vision of TCP as identified in the trail master plan. Elevated Trail Design used their experience to build a short run of single track paralleling the Appalachian Lumber Greenway and beautiful earthen features for a small pump track and bowl and the FlowCoasterTM, a one of a kind roller coaster feature of 4,500’ length for mountain bikers of all skill levels. Our team worked closely together to optimize the location of a small assortment of features within the moderate rolling topography of the site. A critical element of a successful bike park is signage that conveys important messages for facility users. The City of Pickens retained Ride Garden to develop a signage package for several park areas. Directional, wayfinding, and warning / safety signage was necessary to minimize trail user conflicts on the FlowCoasterTM. Ride Garden also developed the park waiver kiosk with trail maps and rules to communicate important information to trail users of park hours, safety rules, and whether the park is closed due to inclement weather. All signage includes colorful, eye-catching graphics that pop and play into the excitement of this facility. A limited services maintenance contract was awarded to Ride Garden by the City of Pickens following the opening of the facility in November 2014. Our team assisted City staff with the development of daily inspection logs, park usage waivers, and trained grounds personnel in how to perform inspection for a bike park facility. Maintenance services will include repair to earthen and wooden riding features, coordination with and assisting grounds personnel for grass establishment and site stabilization, and long term inspections requiring other specialized consultants and contractors. Working with Benchmark Trails, Inc., Ride Garden personnel assisted with the construction of 1,200’ of 6’ wide wooden boardwalk through the Lake Conestee Nature Park property. Construction of the boardwalk was through a swamp and utilized the use of helical screw pile anchors for proper foundation support of overlying wooden decking. with an inspired park concept that can be shared with his community and potential funding partners. HAVE A SPECIAL EVENT? MOBILE RIDE GARDENS AT YOUR REQUEST. 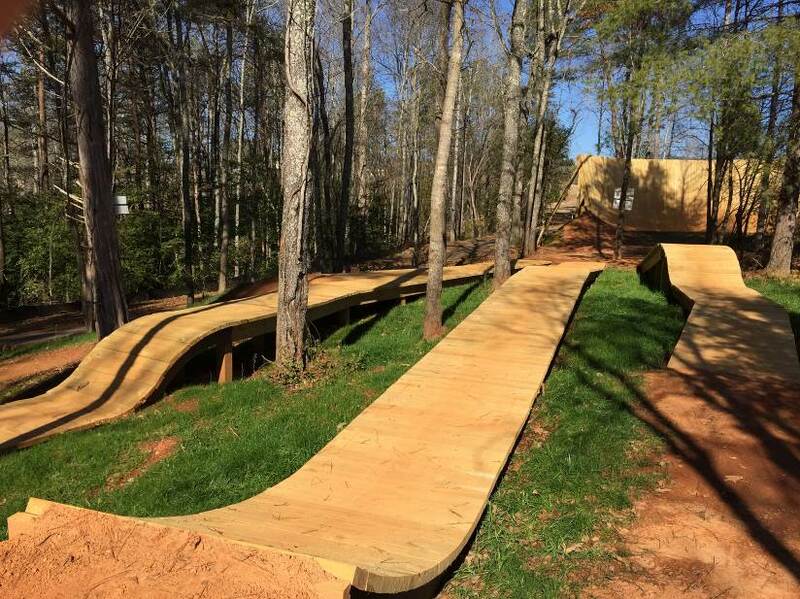 For the past 4 consecutive years Ride Garden has set up its Mobile Pump Track at the Nantahala Outdoor Center’s Guest Appreciation Festival and several other municipal events to encourage participation in the sport of mountain biking. The track is completely mobile and can be setup almost anywhere in about 45 minutes. When the event is over the track can be rolled up and hauled away on an 8×12 trailer with no evidence that it was ever there. We have found that the Mobile Ride Garden is a great way to gain support for new projects at a local level. Built in 2009 and in the early beginnings of the Ride Garden team coming together, this world class mountain board park brought riders in from all over the globe and has been renowned in the mountainboard community as the greatest park ever built. The park boasted a 50 foot C wall, 22 foot vertical wall, a rail bridge, multiple tabletop jumps, hip jumps, jibs and berms. 65 truck loads of dirt were brought in to create the various features. The park was considered the catalyst that ultimately pushed the resort into fully committing to additional summertime activities and amenities such as mountain biking and frisbee golf. Located high up on White Oak Mountain, Stone Hollow Estate boasts 1.2 miles of multi-use trails and scenic overlooks, elevated viewing platforms, and even an outdoor amphitheater. The location is a perfect place for hosting events and enjoying the natural beauty of the mountain. Stylistic rock armoring and edging give this trail system an artistic and sustainable surface that is both beautiful and functional. A new trail extension has recently been constructed by Ride Garden connecting together nearby areas of the property. Information about current RideGarden projects.